Shinkansen / The Shinkansen . By purchasing a classic sightseeing tour to Japan , you will have the opportunity to ride on a high-speed train -. Sinkansene What it is and what it looks like it will become clear when you read our article. 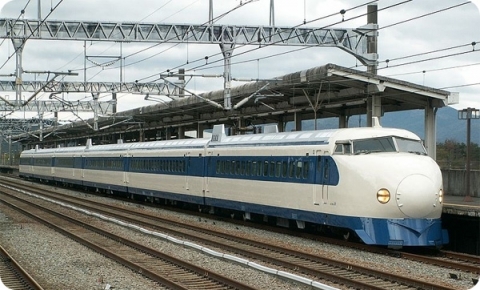 “Shinkansen” (Shinkansen) in a literal translation from the Japanese – “New Trunk Line” – is the common name high-speed rail connecting the most important cities in Japan. “New Line”, this road was named because the Japanese builders first time for laying “Shinkansen” moved away from the practice of narrow-gauge railway – the standard gauge of 1435 mm has become. Prior to this, the whole Japanese railway network was narrow gauge (track width – 1,067 mm). The first section of “Shinkansen” Tokyo-Osaka ( “Tokaido-Shinkansen”) length of 515 km was opened in 1964, on the eve of the opening of the XVIII Summer Olympics in Tokyo. Given that, it would seem, the starting position from which to start your run post-war Japan, were very unfavorable. The economy has been undermined by the aggressive and exhausted by a long war, major cities and many industrial plants lay in ruins (in the beginning of 1946, industrial production was 14% of the average pre-war level). 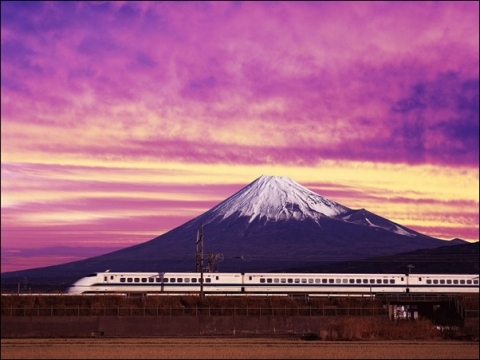 And yet, the world’s first high-speed railway was built in Japan. The first train developed a speed of 220-230 km / h. Now this figure has long been blocked by high-speed trains from other countries, but for its time it was an absolute record. 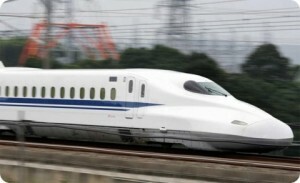 Now high-speed trains – is a symbol of modern Japan, as well as high-quality electronics, reliable and durable vehicles. In 1972, the Tokyo-Osaka area was extended by 160 km to the city of Okayama, and in 1975 on the 393 km to Hakata Station in Fukuoka on about. Kyushu. Train “Hikari” ( “Light”), sometimes accelerates to 210 km / h, overcomes the 1,068 km between Tokyo and Hakata in less than 7 hours. In 1982 came into operation another 2 lines leading from Tokyo to Niigata (line “Joetsu”, 270 km) and the city of Morioka (line “Tohoku”, 465 km). They reach the speed of 240 km / h, and at one site even 274 km / h. On the lines of the train line turn pass numerous tunnels, including an underwater tunnel under the Strait of Shimonoseki between the islands of Honshu and Kyushu. The maximum speed of the trains on the old highway sections – 210 km / h, while the newer – 260 km / h. “Bullet Train” often “fly” at a speed of 300 km, which is comparable to high-speed lines in France, TGV and ICE in Germany. high-speed lines network controlled by a group of Japan Railways Group companies. JR Group rail network is the foundation of Japan’s roads (20135 controls from 27268 km of roads, which is ~ 74% of all highways). It accounts for a large share of long-distance and commuter rail.Initially, the line “Shinkansen” carried freight and passenger traffic day and night. Now they serve only passengers, and in the period from midnight to 6 am, the movement stops for maintenance work. 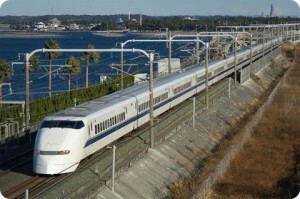 In Japan, there are very few night trains, and they still go on the old railway path which runs in parallel paths “bullet-train” and connect the major cities of the country. 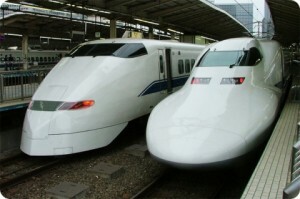 Today, three categories of high-speed trains used in Japan, “Nozomi”, “Hikari” and “Kodama”. Express “Nozomi” – the fastest. Plying on these train lines 500 series to its external appearance, and especially the extended nose section 15 m long, to create the necessary aerodynamics resemble spaceships. Their appearance on the railway lines of Japan completely changed the standards for high-speed roads. 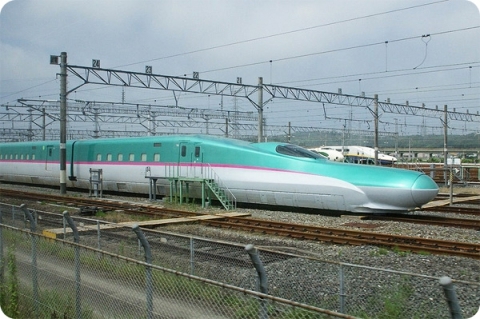 In some areas, “Nozomi” speeds up to 300 km / h and stops only in major towns. “Hikari”, the second speed, and makes stops at intermediate stations, and the “code” – at all stations. However, the speed and the “code” is greater than 200 km / h, even when passing through certain areas and settlements speed “Shinkansen” is limited to 110 km / h.
Despite the high speed, “Shinkansen” in Japan has proved extremely reliable mode of transport: in 35 years of operation, since 1964, have been recorded no fatal accidents (excluding suicides). During this time, it carried more than 6 billion. Passengers. It is also extremely high and “punctuality” of the Japanese high-speed train: the average annual delay is less than a minute, even at peak loads, it is not more than 3-4 minutes. 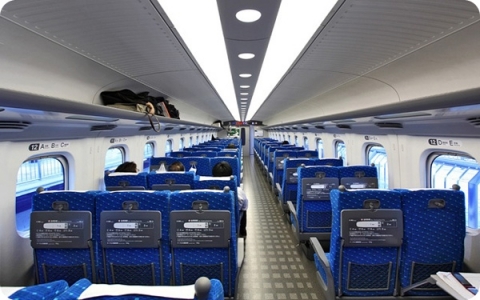 Becoming a convenient and affordable mode of transportation, “Shinkansen” in many cases, it is today the most optimal way to travel in Japan. This range of motion in the morning and evening peak hours of 5-6 minutes! 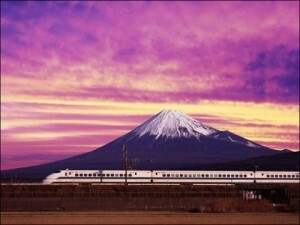 It is no coincidence third of all costs in the operation of “Shinkansen” falls on technical support. 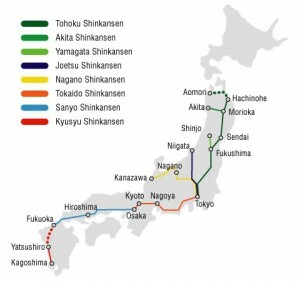 There are plans for further development line; in particular, it is expected to start up train “Shinkansen” between the towns of Nagano and Kanazawa, Fukuoka and Yatsushiro. Farthest from the planned new routes – the northern Japanese island of Hokkaido – will pass through the tunnel Seikan length of 54 km under the well-known for its storms Tsugaru Strait. However, the construction of this line will not begin before 2020, and the feasibility of such a project yet to be explored. Narita Airport. How to get from Narita Airport to Tokyo. How to get from Tokyo to Kyoto? 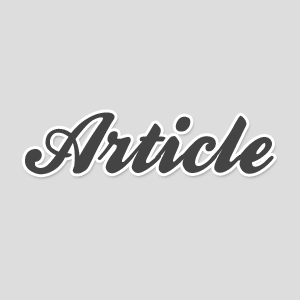 The Japanese currency – the Japanese yen. Popular ski resorts in Japan. Miyako Island and Miyako Jima. Tsukiji Fish Market in Tokyo. Summer in Japan. Summer tours to Japan. Autumn in Japan. Tours to Japan maples. New Year in Japan. Tours to Japan for the New Year.